World Hemophilia Day is an international awareness day for hemophilia and other bleeding disorders. 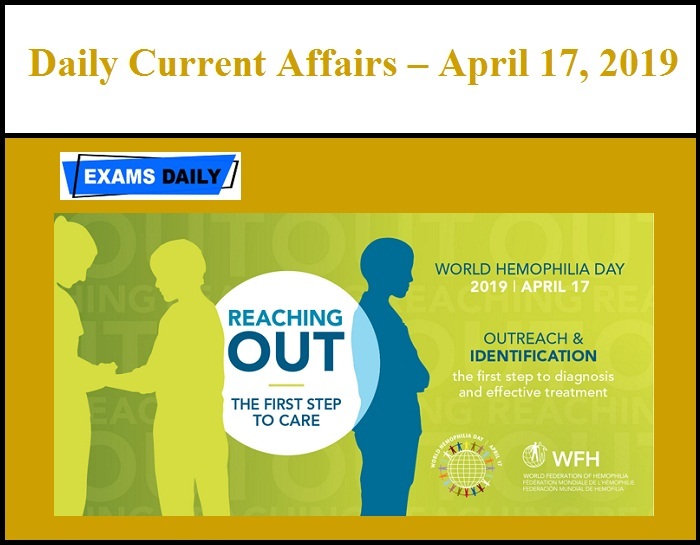 It is held annually on April 17, date of the birthday of Frank Schnabel, founder of the World Federation of Hemophilia. 2019 Theme: “Reaching Out: The First Step to Care”. Cairn Oil & Gas, a vertical of Vedanta Limited, has appointed Ajay Dixit as its chief executive officer (CEO). Mr. Dixit succeeds Sudhir Mathur. A one-day National Consultation on Loss and Damage, to deliberate and brainstorm on emerging perspectives on approaches to assess, minimise and address climate-related loss and damage, was hosted by the Ministry of Environment, Forest and Climate Change in New Delhi inaugurated by Additional Principal Secretary to the Prime Minister, Dr. P. K. Mishra. The Madurai Bench of the Madras High Court had asked the Tamil Nadu government to ban TikTok. As a Result, The Chinese video app TikTok is no longer available in Google and Apple app stores in India after the Madras High Court prohibited its downloads. The debrief of Exercise Sea Vigil was held on 16 Apr 19. The debrief was chaired by Vice Admiral MS Pawar. The maiden national level Coastal Defence Exercise SEA VIGIL was conducted by Indian Navy from 22-23 Jan 19. Indian Navy undertook the second edition of the bilateral maritime exercise between Indian Navy and Vietnam Peoples’ Navy at/ off Cam Ranh Bay, Vietnam from 13 to 16 Apr 19.